Multicast is an efficient way of sending traffic. We can have one or multiple sources and a group of receivers. Multicast-enabled routers keep track of all receivers and use a multicast routing protocol like PIM to ensure traffic is only forwarded on the correct interfaces. Above we see a server which is streaming traffic to multicast destination 239.1.1.1, the destination MAC address is 0100.5e01.0101. The switch in the middle will check its MAC address table to figure out where to forward traffic for this McAC address. The problem here is that this MAC address has never been used as a source, so the switch will never learn this MAC address. The switch won’t know where to forward these frames to so it will just flood it everywhere. IGMP snooping is the most popular choice nowadays and we covered it in another lesson. In this lesson, we’ll take a closer look at CGMP. Back in the 90s, Cisco was looking for a good solution to deal with L2 multicast traffic. IGMP snooping was CPU-intensive and/or required special expensive ASICs since the switch has to inspect IGMP traffic. The idea behind CGMP is simple: a multicast router knows about the state of each multicast group. It receives IGMP membership reports from receivers so it knows which devices want to receive multicast traffic and for which groups. Since the router knows everything, why not share this information with the switch? L2 switches don’t care about IP addresses so the router will have to inform the switch about the MAC addresses of the receivers and multicast groups. The router shares these MAC addresses with the switch which allows the switch to update its CAM table entries. Multicast traffic will then only be forwarded on the correct interfaces and life is good. CGMP is a simple protocol, the routers are the only devices that are producing CGMP messages. The switches only listen to these messages and act upon it. CGMP uses a well-known destination MAC address (0100.0cdd.dddd) for all its messages. When switches receive frames with this destination address, they flood it on all their interfaces which so all switches in the network will receive CGMP messages. The group destination address is the multicast group MAC address, the unicast source address is the MAC address of the host (receiver). We will take a closer look at these two addresses. Nowadays, CGMP is hardly ever used. This is probably because IGMP snooping is supported in the ASIC of any modern switch and unlike CGMP, it’s a standard. CGMP is Cisco proprietary and it’s difficult to find a catalyst IOS switch that supports it. Let’s take a closer look at how CGMP operates. When CGMP is enabled on a router, it will start sending CGMP messages where the GDA (Group Destination Address) is zero and the USA (Unicast Source Address) is set to its own MAC address. This first message is sent so the switch knows that there is a multicast router on the interface where it received the CGMP message on. This message is repeated every 60 seconds. We have one router (R1) and two hosts (H1 and H2). For each device, I added the IP address and MAC address. The multicast group address I will use is 239.1.1.1, this group uses MAC address 0100.5e01.0101. Unfortunately, I don’t have any old switches that support CGMP so I can’t show you the output of the switch. However, since the router is the only device that produces CGMP messages you won’t miss much. Above we see that the destination MAC address is the CGMP address, 01:00:0c:dd:dd:dd. It also shows the GDA and USA. The MAC address of multicast group 239.1.1.1 is 01:00:5e:01:01:01 which is stored as the GDA. The USA is the MAC address of H1. When the switch receives this packet, it will check its CAM table and searches for the interface that is associated with the USA. It will then add the GDA to this interface so that multicast traffic for this group is now forwarded on this interface. 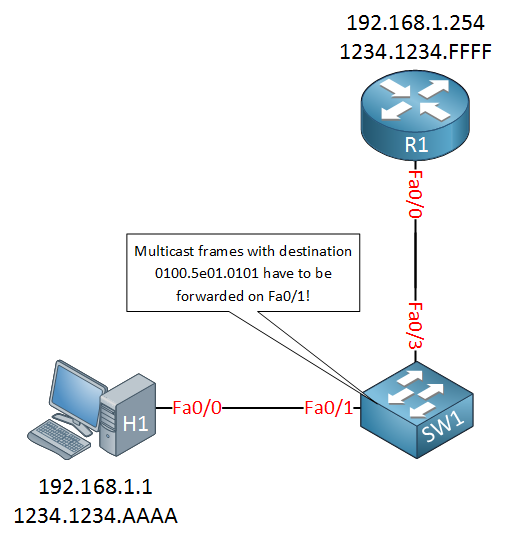 This leave packet is sourced from the MAC address of the host but sent to the “all multicast routers” address (224.0.0.2) and not to the multicast group address. The router will have to inform the switch through CGMP that a host has stopped listening to a certain multicast group. It does so with a CGMP leave message. The router can copy the source MAC address of the host from the IGMP membership report to the USA in the CGMP leave but it doesn’t know the MAC address of the multicast group. It will look for the multicast group address in the membership report and calculates the matching MAC address, which is entered as the GDA. I think multicast address should be 01005e in this pic or not ? Thanks, just replaced this image!